Two years ago, I joined Twitter as a way of sharing some of the interesting links I come across. I’ve since given up Twitter, but there are still some great links I like to share from time to time. Here’s the first batch. I’d like to start with two incredible musical performances. First up, here’s what is probably the best late night TV musical performance I’ve ever seen. Jim James, backed by the Roots, performing “A New Life.” All the musicians are smiling by the end of this song, so you know it’s good. James has one of my favourite voices, especially when he really starts belting it out near the end of the song. As I can’t figure out how to embed the video in WordPress, just click here to watch. Second, here is the ever-inventive Beck covering David Bowie’s “Sound and Vision” — with a 167-piece orchestra. There’s a gospel choir, a guy playing a saw, three xylophones, a yodeler, even one of those huge Alpine horns. The only downside? Well, it’s sponsored by a car company, unfortunately. But still a great video that’s worth watching. I can’t imagine how long it took to rehearse. Third, I recently discovered a Canadian news and opinion website called Ballast. It’s updated daily and definitely worth checking out. Here’s a fun little article from a Ballast contributor on whether Winnipeg or Toronto can lay claim to Neil Young. Fourth, here is a book that sounds really interesting. I might save it for the flight (see #5 below). 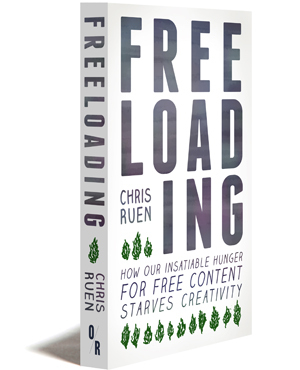 It’s called Freeloading: How Our Insatiable Apetite for Free Content Starves Creativity, by Chris Ruen. This looks like a fascinating treatment of a very relevant issue facing the arts today. Fifth, we recently bought our plane tickets to England for my sister-in-laws’ weddings in April (yes, two weddings!). We depart on Good Friday and we will be gone for just over two weeks. Four days of the second week will be spent touring several universities that I’m interested in. One of the schools I’m looking forward to touring the Bauman Institute at the University of Leeds. Nerdy, I know. I also plan to hit up several Chesterton landmarks while I’m in London. Gotta pay homage to the big guy. I’m reading his autobiography right now in preparation. It’s as witty and insightful as ever. Classic Chesterton. Okay, that’s all the links I’ll throw at you for now!